When: Thursday, Jan. 28 at 9 p.m.
Hopefully everyone is well-rested after being snowed in for a few days, because it’s time to stay up late on Thursday for a 9 p.m. matchup between the Colonials and Spiders. Richmond has struggled in A-10 play after a strong start to the season, including a win over then-No. 14 California in non-conference play, while the Colonials could use a big victory to cement their place as a contender. Richmond has some firepower, but the Colonials have been better overall. 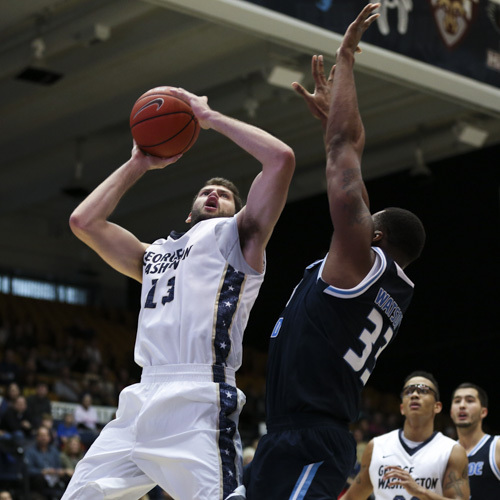 GW owns the third-best scoring margin in the Atlantic 10 Conference at +8.3 points per game. Richmond is eighth at +4.9. Richmond’s offense is the third-best in the league, scoring 79.2 points per game, but GW’s defense is allowing 66.8 points per game on average. When held to that threshold or below, Richmond is 0‒3. This game also may be one in which GW’s bench has the edge. The Spiders essentially play eight-deep and that may look more like seven in this game. Especially against a bigger GW team, Richmond’s defense may struggle even more than usual while trying to avoid fouling. The Colonials will also have a distinct advantage off the glass. GW is averaging 38.3 rebounds per game while Richmond is pulling down only 32.8. That’s not solely because of good shooting: The Spiders nab only 25.5 percent of available offensive rebounds while the Colonials get 33.8 percent of those available to them. Second chance points could be very lopsided in this game. Richmond comes into the game off back-to-back losses, including one in overtime to local rival VCU and the latest to Davidson in which the Spiders were 0-for-15 from beyond the three-point line. That’s plenty of bulletin-board material for Richmond to get up for a potential road upset. Guard ShawnDre’ Jones has been a perennial issue for the Colonials, and has taken on a bigger role in Richmond’s offense this year. Jones is scoring 15.9 points in 34 minutes per game aided by 43 percent shooting from beyond the three-point line. Jones is one of a trio of high-scoring players for the Spiders. Forward Terry Allen averages 20.2 points per game, third-best in the A-10, and frontcourt mate T.J. Cline is not far behind at 16.2. Allen is also the team’s leading rebounder at 8.3 boards per game. Richmond, overall, makes 7.9 threes per game and the Spiders shoot 49 percent from the field. The bottom line: Allen and Cline against Kevin Larsen and Tyler Cavanaugh should be an interesting battle of the bigs, and it’s always interesting to see how GW handles a driver like Jones. Overall, though, GW is a stronger team at home. The biggest thing that could swing this one – in either direction – is shooting. Richmond relies so heavily on its ability to score that another off night could mean a blowout. Conversely, GW is likely to get good looks, but if the team can’t capitalize on them, the Colonials could struggle to keep up with the Spiders.